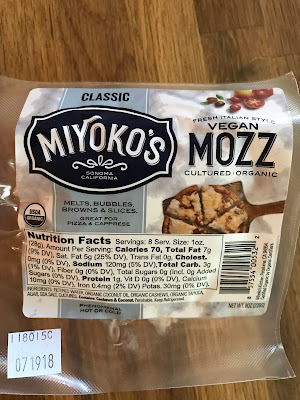 I’m not sure when I first heard of Miyoko’s, maybe a few years ago, but I’d had my eye open for a while in the vegan section at the grocery store. (Although, to be honest, I might have gotten sidetracked by Green Valley Organics’ lactose-free dairy offerings!) Miyoko’s make cultured nut cheeses, sometimes fermented, and that’s what gives their cheese the tang that is often missing from vegan offerings. I first saw the vegan cheese wheels, which are essentially spreadable cheese. My Whole Foods doesn’t have all the flavors, but I tried Classic Double Cream Chive and Garlic Herb. I originally liked the latter the best, because the taste is strongest, but the Little Prince tasted them both and, while he doesn’t like the garlic one at all, he has declared the double cream chive to be his favorite cheese EVER and kept asking for more, so I bought another one. I found the cheese wheels to be a bit stiff (as is some spreadable dairy cheese, to be fair), but it was still possible to spread it on crackers, and I’m sure it would have been good on bagels, too. They are both made from a base of cashews, water, and coconut oil, with a little funk from rice miso and a lot of umami from nutritional yeast, but the double cream chive was definitely milder (I’m sure the other one left me with garlic breath, but as I was mostly eating it for lunch, I think only the Fox would have complained, and he can’t talk yet). It’s not quite the texture or flavor profile of the spreadable Boursin of my youth, which I still miss (the Boursin, not the… although… never mind), but it’s delicious. 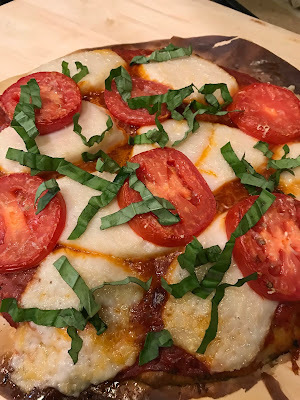 Then I tried the Fresh Vegan Mozzarella, made mostly from water, coconut oil, cashews, and tapioca (see here for another review). I basically mixed these two recipes to make margherita pizza. This is by far the best vegan cheese I’ve had on a pizza! It’s super creamy, it melts, it browns… It’s a bit too soft to slices as cleanly as dairy mozzarella, but that could work in its favor because I think I would also use it instead of ricotta by mashing it up a little. The products are obviously not nut-free, but all the regular product lines are gluten-free, only one product contains soy, and the company hopes to be certified kosher this year. And since it’s a vegan company, it’s lactose-free, too. It’s possible to buy their in Canada, according to their FAQ page (scroll down), though you might have to order them online. I’ll sure be buying them again!